Texas = scorching hot summers. 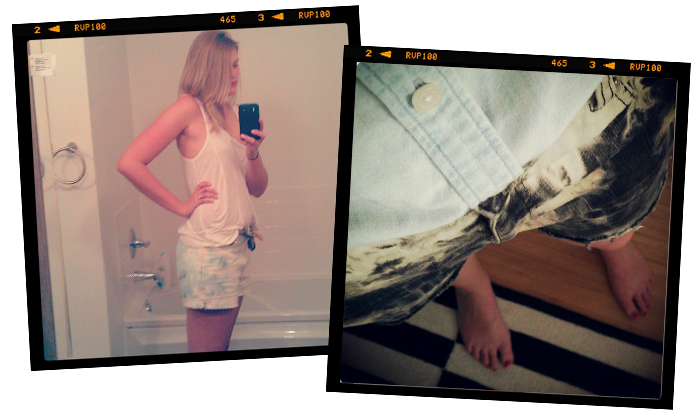 Scorching hot summers = shorts. My closet = 2 pairs of shorts. To make amends with this little fashion dilemma, I needed to stock up (and quickly) since the temps are already in the 'it feels like summer, and hell no I am not going to wear pants' zone. I headed to the thrift store and bought 2 pairs of absolutely heinous tapered-leg mom jeans. When I tried them on, I had about a 5 minute gigglefest. Literally. I gave myself a budget of $10, and came flying in at $4.83 for both pairs. Hurrah!! When I got home, I made some preliminary chops and got the fit somewhere in the ballpark of where I wanted it to be. I like to cut my shorts a little longer and fold them up, but the fray situation might get a little OOC. Who knows. Can always cut more later on. After I cut them, I crinkled them up into a little ball and tied it off with twine. Here's your que to go change into some ratty clothes, because I don't want to get my rear end kicked because someone got bleach all over their J.Brands. Cool? Ok. Onward we march. 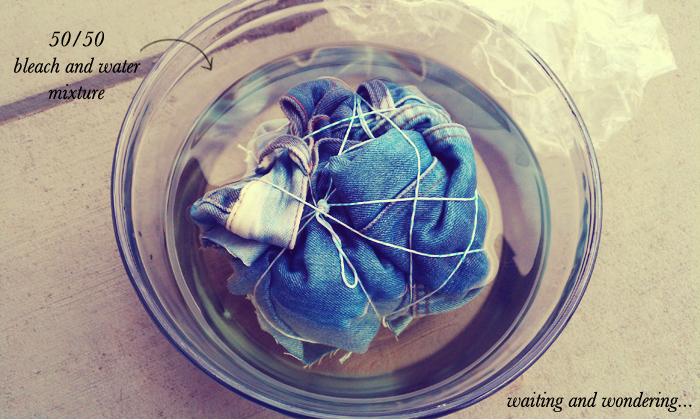 Put your little denim ball in a bowl and make a 50/50 bleach-water solution. I ran out of bleach and couldn't fill it to the top, so in that case, just use tongs to rotate the jeans around so they get evenly dyed. Really nice jeans will take about an hour to bleach out, but since there were el cheapo jeans from Old Navy Outlet and Ralph Lauren, I saw results in about 15-20 mins. 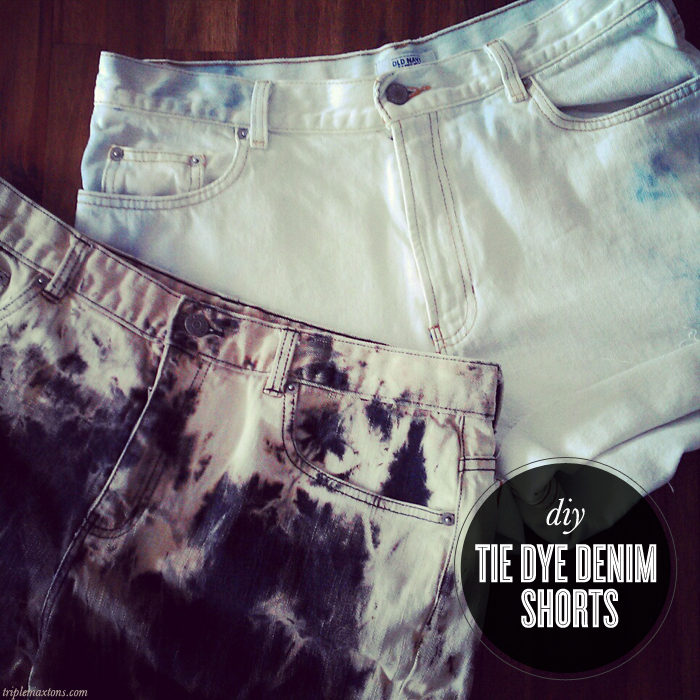 The jeans will lighten up after you wash them, so be careful not to overdo it on their bleach bath time. I also covered the bowl with a hotel shower cap so the bleach fumes wouldn't take over my apartment and singe my nostrils. It didn't really work that well, but hey, I tried. Word to the wise here: if you are doing 2 batches like I did, do the lighter denim first. 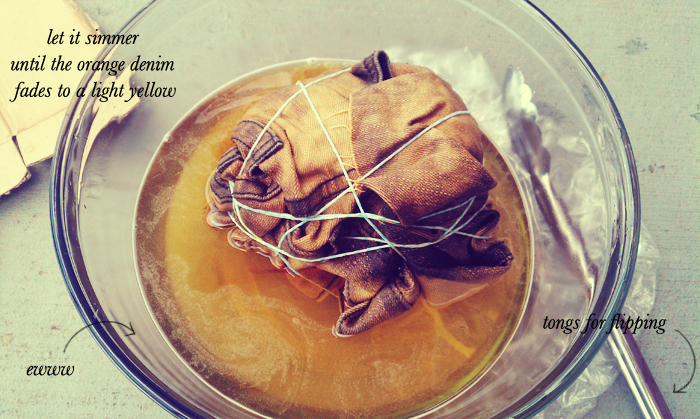 The black denim started seeping this super bright orange/yellow dye and turned the bleach/water mixture yellow. When you are done, carefully dump the bleach and jeans out into the sink. Cut the strings to reveal your tie dye masterpieces (my fave part!!! ), and rinse with some water. Transfer (without dripping any bleachy water from the shorts onto the floor/carpet/basket of laundry like I did) to the washing machine. Wash and dry the shorts ALONE, and give yourself a high five over your rad new shorts that cost less than lunch at Torchy's Tacos! HAHAHA omg poke....so awkward, riiight? Ohh la la! i will definitely have to give this a try. I love it! Clever girl, these turned out so RAD! OMG love! 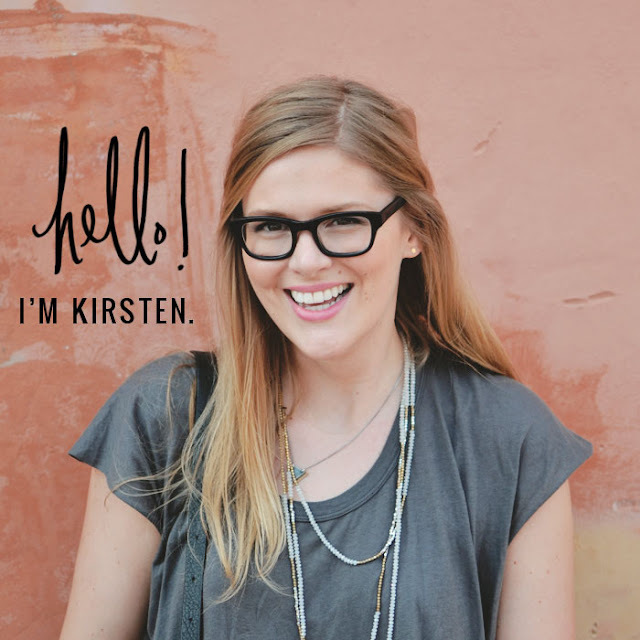 I am such a wimp when it comes to DIY projects like this but I might have to give this one a shot! do you have to use hot bleach? Nope, just used plain old room temp bleach! Stupid question, can I use toilet bleach? No, you shouldn't use that. Just used plain old bleach! It looks great ! I'm doing the same with my black jeans , but how long does it take it for them to transform from red to white ? 15 mins? I just let them chill in their bleach bath until it was gone.